We are also requesting that Symantec provide us with a detailed set of steps they will take to correct and prevent each of the identified failures, as well as a timeline for when they expect to complete such work. Symantec may consider this latter information to be confidential and so we are not requesting that this be made public. Sometimes, websites try to use HTTPS to be secure and get it mostly right, but they have minor errors. Until recently, Chrome marked this security state with a yellow “caution triangle” badge on the page security icon in the URL bar. 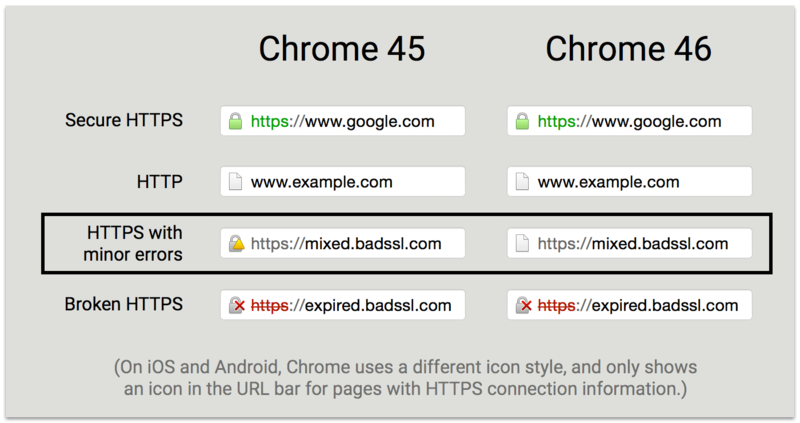 Starting with version 46, Chrome will mark the “HTTPS with Minor Errors” state using the same neutral page icon as HTTP pages. This change is a better visual indication of the security state of the page relative to HTTP. Chrome users will have fewer security states to learn. This change will mainly affect HTTPS pages that contain certain mixed content, such as HTTP images. Site operators face a dilemma: Switching an HTTP site to HTTPS can initially result in mixed content, which is undesirable in the long term but important for debugging the migration. During this process the site may not be fully secured, but it will usually not be less secure than before. 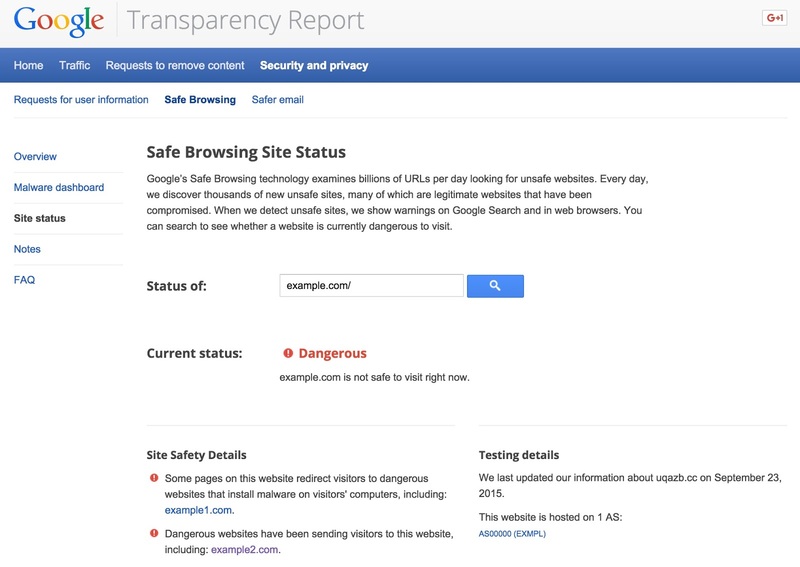 Removing the yellow “caution triangle” badge means that most users will not perceive a warning on mixed content pages during such a migration. We hope that this will encourage site operators to switch to HTTPS sooner rather than later. 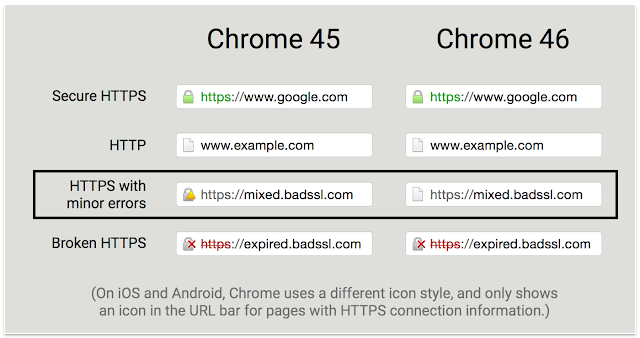 This change will reduce the number of page security states in Chrome from four to three. We have to strike a balance: representing the security state of a webpage as accurately as possible, while making sure users are not overwhelmed with too many possible states and details. We’ve come to understand that our yellow “caution triangle” badge can be confusing when compared to the HTTP page icon, and we believe that it is better not to emphasize the difference in security between these two states to most users. For developers and other interested users, it will still be possible to tell the difference by checking whether the URL begins with “https://”. In the long term, we hope that most sites on the internet will become secure, and we plan to reduce the icon to just two states: secure and not secure. The change announced in this post is a small step in that direction.